Casings are long pipes made of steel or plastic which line the new well to prevent collapse during drilling and contamination of the water below. Between the well wall and the casing is a two-inch gap called the annulus. This is filled with gravel and capped with cement for the last twenty feet to the surface to prevent contaminants from the surface getting into the well and ruining the water source supplying it. Casings also help protect the well from freezing in extreme cold during the winter months. 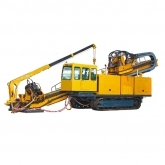 While some well drilling companies install the casing as it drills, others might also install the piping separately after the drilling is complete.